This weeks rig is a step back from the complex four light rigs I’ve been covering recently to a two light rig. 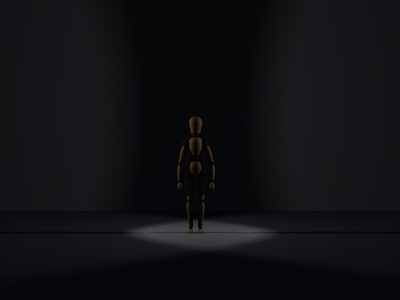 This time the lights are placed on either side of the stage shining horizontal beams with the lights at head height or above so they shine down onto an actor. Lights placed like this produce a vertical corridor of light across the stage that can be tailored to how much the actor will be moving. This rig provides good visibility and modelling. It creates very long, unnatural shadows. These may fall on props and scenery drawing attention to the lighting’s styalised nature unless the scenery’s texture is designed to hide them. Shutters may be placed to prevent light spilling on to the backdrop, off the front of the stage or on to scenery. 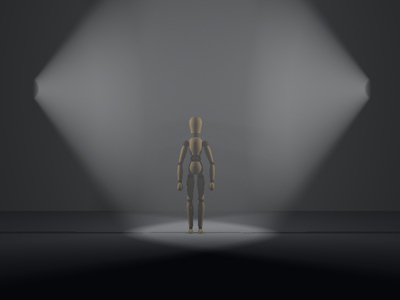 This rig, and variations with multiple horizontal light sources or light sources at other heights off the stage, can be particularly useful if an actor has a lot of movement in their performance. It is especially useful for lighting dance because of the provision of good modelling while allowing for significant movement. As for all the previous rigs, all of the above images were made using Poser 7 and Vue 6 Infinite. They could have been made using any version of Vue 6 including Vue 6 Pro or Vue 6 Easel and any version of Poser since Poser 4.